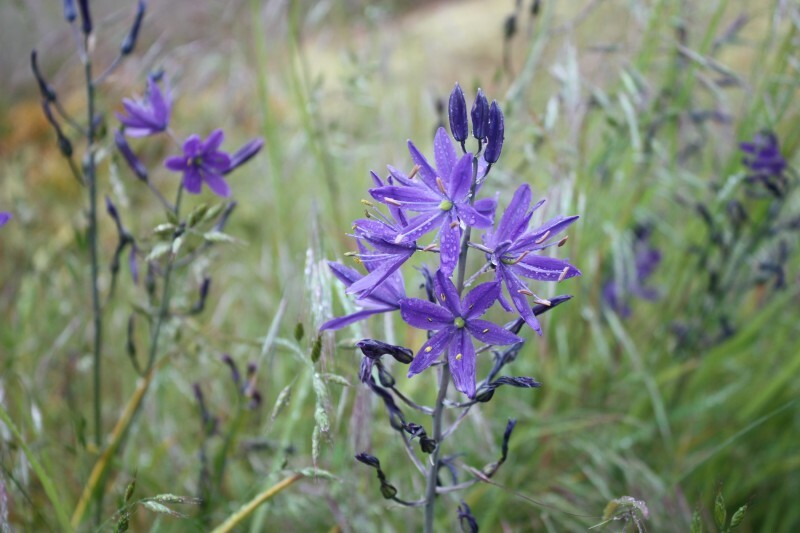 This is a West of the Rocky Mountains flower the men called “Le Camas,” and it is mentioned in many of the York Factory Express journals. Generally it was one of the selection of “Roots” that the express men purchased from the Natives on their way upriver. You will recognize this flower. It appears on the header of my website, and is a flower that was familiar to everyone who worked in the Thompson’s River District (Kamloops), the lower Columbia (Fort Colvile and Tobacco Plains area), at Fort Nisqually (Tacoma, WA) and Fort Victoria (Victoria, B.C.) The Natives traded the bulbs of this plant, and literally farmed it! In a walk thro’ the woods I found the common strong-scented black currant, and another kind of black currant, with gooseberry leaf, wood covered with soft weak prickles; berry well flavoured & fursed, colour jet black. Banks [of the Saskatchewan River] covered with the willow, aspen, birch, poplar, and occasionally a few spruce. I live on the far west coast of British Columbia, and so have no real idea what kind of “black currant, with gooseberry leaf,” this plant might have been. Of course I am curious, so if any of you who are Saskatchewan residents can identify this plant, I would love to have the answer! I have to also say that I didn’t believe the tree that Douglas said was a pine actually was — but I was wrong. The trees that grow in the boreal forest of Saskatchewan are White Spruce, Black Spruce, Jack Pine, Balsam Fir, Tamarack, Trembling Aspen, Balsam Poplar, and White Birch — plus a few minor species. By the way, Thorburn’s Rapids (named for a Trader in David Thompson’s time) no longer exists, as it is buried under the water of Tobin Lake. So let’s start in Manitoba, near the shores of Hudson Bay, where Aemelius Simpson described the “stint’d” Pines he saw along the lower Hayes River. The experts say they were almost certainly Black Spruce (or, perhaps, White Spruce), though many other species of trees grow there, too. The face of the Country assumes a different character along our Days Track. The Hills are now rounded taking their rise gradually from the Banks of the River, & forming a chain or ridge of Hills running parallel with the course of the River, bearing a stint’d growth of Pines, with Birch, & a variety of Shrubs. The Scenery about the Rock Portage is very picturesque & romantic. The country from the Factory [York Factory] to this place is thickly wooded with the spruce, larch, the Scotch fir, patches of poplars, and dwarf birch, with willow in the vicinity of waters. Generally speaking the surface of the soil is covered with a thick coating of lichen, amongst which the Labrador tea plant grows with great luxuriance. The only other plants I observed are the French willow, and Cranberry, and two others plants with whose names and properties I am not acquainted. Labrador Tea Plant is well known and grows both in the east and the West. But I looked up the Scotch fir to find out what tree it was, and discovered it is a medium large two-needled pine of Northern Europe and Asia, with flaking red-brown bark. Two needles indicates Jack Pine, and I think that is exactly what it is! Our coastal Jack Pine are shrubby little things, but that is not true of the eastern Jack Pines. We proceeded part of day up the River through narrow channels formed by Islands where the water was very shallow and nearly choked up with mud. At the lower end of the River the shores and islands are very low, composed of soft mud or clay and covered with reeds, & flags, and here and there some willows to the waters edge. A little farther up the river the banks continued still low and are entirely thickly clothed with willows, poplars, &c., they are sometime so thick that it would appear difficult to get through them. Cedar Lake was named for the cedars that grew along its shore. These cedar are, of course, the Eastern White Cedar, which ranges from Manitoba all the way to Hudson Bay and beyond. And, yes, the lower Saskatchewan River east of Cumberland House was always a messy, muddy river to travel. Encamped 4 miles before reaching Sturgeon River, upon the banks of a small river which runs thro’ a narrow valley bordered with willows, and the banks thickly covered with grass, which is a most eligible situation for our encampment as we are completely shut out from observation, and run little risk of being discovered by any roving parties of horse thieves. From Eagle Lake to Berland’s Lake the country is in general densely wooded with the white spruce, poplar & birch, but from that place to Sturgeon River it is totally different in its character. Instead of the gloomy interminable forest we have met with the extensive prairie variegated by pleasant groves of trees, and watered by numerous tiny lakes and small streams of water. The surface of these prairies is thickly covered with various grasses indicating a rich productive soil. The banks were in some places lower than these days past, & thickly covered with wood, chiefly pine. I also observed some fir and silver pine trees, besides poplar & birch. Silver Pine Trees? What are they? They are the Englemann Spruce, also known as White Spruce, Mountain Spruce, or Silver Spruce! The Englemann Spruce is a high mountain tree native to Western North America — including Alberta and British Columbia. I already knew that this is one of the massive trees that grows on the west side of Athabasca Pass. As it was noon before we started we did not go far. The road was first along the shore of the Lake & [Athabasca] River & then through the woods, some parts of which were very thicketty & some places very swampy in the bottoms of the valleys. The mountains rising one behind another in succession still appearing higher the farther we advance. The course of the River is nearly from S to N winding through the valley and the mountains rising abruptly on both sides not in one continued chain but here and there broken by a small valley or kind of fissure, out of each of which issues a small river or creek which contributes to increase the size of the main river. The woods climb in many places a considerable distance up the sides of the mountains, and often to the very summit of some of the lower ones, which creates some surprise how they can grow as there appears to be nothing but bare rocks… The woods which ascend highest up the sides of the mountain is pine, in the valley pine, fir, & [blank] are to be found. Some of the pine and [blank] are of a very large size. Different kinds of willows & underwood are also met with. The trees that grow in the Jasper Valley are Douglas fir, Lodgepole pine, White Spruce, and Trembling Aspen. Those that grow up the mountainsides are the Englemann spruce and the White spruce hybrids. There is also Tamarack here, which is Larch — Balsam Poplar and Black Cottonwood also grew here. Shrubs will include Juniper, willow, and Buffalo berry. The hill which we came down is covered with very large wood, chiefly pine and cedar, some of the largest of the latter are 12 feet in circumference. I measured one which is 18 feet in girth. Some of the largest of the pines were 10 to 11 feet in girth. There is also a small shrub called the prickly ash. Some birch are met with at the bottom of the hill. The cedar are not found farther up than about the middle of the hill. “Prickly Ash” is Common prickly ash, or northern prickly ash, a small aromatic shrub or tree that is a member of the citrus (Rutaceae) family. Oil extracts from its bark have been used in both traditional and alternative medicine, and the Natives chewed its bark to cure their toothaches! Its Latin name is Zanthoxylum americanum. Who knew? 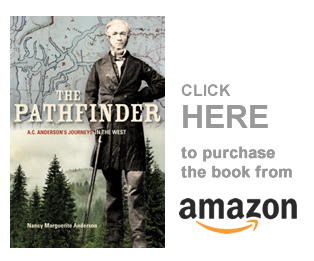 Of course, once the York Factory Express men reached the West side of the Rocky Mountains, they were whisked down the Columbia River so quickly that they now had no time to look at the trees that surrounded them. At Fort Colvile the country opened up, and the undergrowth disappeared. Once past Fort Colvile they entered the desert of the Columbia basin, and the only trees they saw were the drift-trees from upriver. It was not until they passed through the last of the rapids that separated the upper river from Fort Vancouver, that they would see trees and bushes again. I am impressed these men identified the trees as well as they did. It was a long journey from Hudson Bay to the Pacific coast, and the York Factory Express men passed through many different climates, that supported many different types of trees. Some of these men had an interest in nature, of course, and many were quite well educated. But these trees were new to them (though not remarkably different than those in Europe)! The Gentlemen must have been able to ask their more experienced companions in the York Boats “what kind of trees where those?” Apparently they did, and their teachers gave them remarkably accurate information.